Today’s Recipes: Thanksgiving Turkey and Green Bean Pot Pies, Rich Turkey Tetrazzini Casserole, and Turkey Enchilada Casserole. When the weather turns cold I start thinking about warm comfort foods. With family arriving for the holiday, I also look for ways to use the leftovers. I want dishes that can be assembled ahead, cook without a lot of fuss or last minute work, and can feed a crowd. Casseroles and pot pies do the trick every time! The pot pies that I grew up with were frozen and while warm and filling, weren’t particularly good. Today they can be made very easily. It doesn’t get much simpler than this all-American version and it is perfect for this weekend because it uses your leftover green bean casserole and turkey. You don’t even have to worry about making a crust because you can use frozen puff pastry. One of my favorite ways to use leftover chicken (or in this case turkey) is to make Mexican food. Tacos and burritos are great but they require a lot of attention. This layered enchilada casserole has all the flavors of traditional rolled enchiladas but can be assembled ahead and baked later on. If you like spicier foods, feel free to add Tabasco, Sriracha, or another hot sauce to perk it up. You can also add more chiles to the sauce. 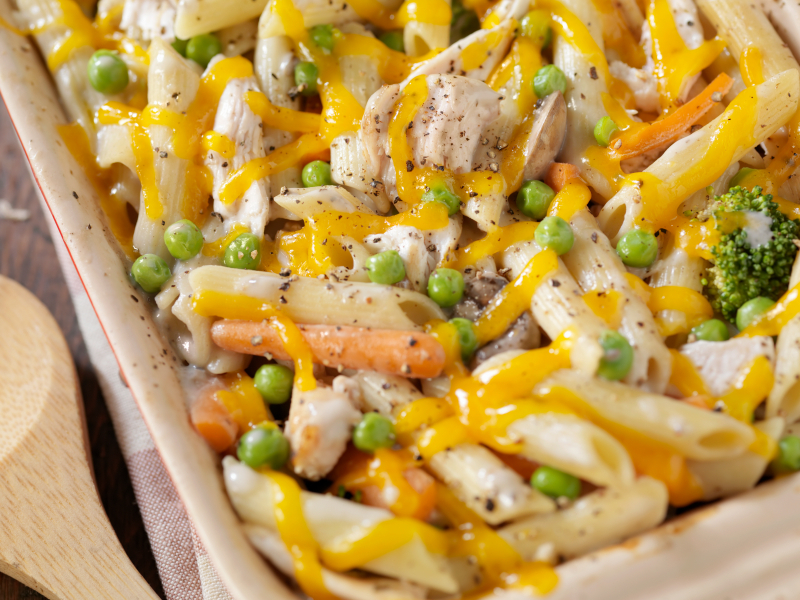 If Mexican isn’t your favorite cuisine, you can try the old Italian standby, Turkey Tetrazzini. Even if you think you don’t like it, give this version a try. It isn’t the same boring, flat, heavy dish you remember from your childhood. This is rich, creamy, and full of vegetables. A Parmesan and panko breadcrumb topping gives it a nice crunchy texture and if you want to sprinkle some extra shredded cheese over the top, you can. This is a dish every child in your house will love and it is another great way to use up leftovers from Thanksgiving. If you have extra vegetables left from a salad or crudite platter, you can lightly steam them and add to the casserole. If you are short on time you can substitute frozen veggies that you have thawed. Mix and match to your heart’s content and use whatever is in the refrigerator to fill it out. This year, instead of having turkey sandwiches coming out your ears, try one of these recipes and enjoy a different take on your holiday leftovers! In a medium bowl lightly blend leftover green bean casserole with milk, stock and turkey. Cut out 6 (4-inch) disks from each sheet of puff pastry. Lightly press the disks into the bottom and up the sides of 6 (1-cup) muffin tins or ramekins, leaving about 1/2-inch crust over the edge to secure the top. Poke holes with the tines of a fork into the bottom and the sides to dock the pastry. Pour filling into each cup to just below the top and cover with another cut circle. Secure the edges by pinching them together and press the tines of the fork around the edges to seal. Cut a small hole in the top to release steam. Bake for 30 minutes or until crust is golden brown and filling is bubbling hot. If you didn’t make green bean casserole for Thanksgiving, don’t worry. Make a simple white sauce with a roux of butter and flour, add milk, onion powder, salt, and pepper, and stir until thickened. Add steamed green beans or frozen mixed vegetables and you are good to go! Preheat oven to 350°F. Butter a 13x9x2-inch baking dish. In a large saute pan, heat oil over medium-high heat. Saute onions and poblano until softened, about 3 to 5 minutes. Add garlic and cook, stirring, for 1 minute. Stir in half of the enchilada sauce, chili powder, cumin, and oregano until completely blended. Add beans and turkey. Cook until warmed through, about 5 minutes. Season mixture with salt and pepper to taste. Pour half of the remaining enchilada sauce over bottom of baking dish, spreading to cover completely. Place 6 tortillas on bottom of prepared dish, overlapping them to cover bottom completely. Spoon half of turkey mixture evenly over tortillas. Cover with 6 tortillas. Top tortillas with remaining enchilada sauce. Spread with remaining turkey mixture and half of cheese. Cover with 6 more tortillas. Pour salsa over tortillas and top with remaining cheese. Sprinkle top with green onions. Bake in the middle of the oven until casserole is heated through and bubbling at edges, about 1 hour. Remove from oven and let sit for 15 minutes to firm up slightly before cutting. Serve with a dollop of sour cream and shredded lettuce as garnish. By © 1998 Jane Bonacci, The Heritage Cook. All rights reserved. 12 oz wide egg noodles, penne rigate, fettuccine, spaghetti, etc. Preheat the oven to 375°F. Butter a 9x13-inch baking dish and set aside. Bring a large pot of well-salted water to a boil and cook pasta until al dente, time will be determined by type of pasta you choose. Drain in a colander, toss with 2 tsp olive oil, transfer to a large bowl, and set aside. Meanwhile, in a very large skillet, saute the onions and bell peppers in 2 tbsp butter over medium-high heat until soft, 3 to 5 minutes. Add the garlic and cook for 30 seconds, stirring. Add the mushrooms and thyme and cook, stirring occasionally, until the mushrooms are soft and have released their liquid, about 6 minutes. Remove from the heat and stir in the lightly steamed vegetables to warm them. Add to the bowl with the pasta. Stir in the turkey, peas, salt and pepper. Set aside. In a saucepan melt the remaining 4 tbsp of butter over medium heat. Sprinkle with the flour and cook, whisking constantly, for 2 minutes until the flour no longer smells raw. Add the wine and chicken stock and cook, stirring, until smooth and thick, about 2 minutes. Whisk in the heavy cream and bring to just below a boil. Reduce the heat to medium and simmer, stirring regularly, until the sauce is thick enough to coat the back of a spoon, 15 to 20 minutes. Pour sauce over turkey, pasta, and vegetables, tossing until evenly coated. Transfer mixture to the prepared baking dish and sprinkle with Parmesan and panko breadcrumbs. Top with shredded cheese. Bake uncovered until bubbly and golden brown, about 30 minutes. Serve hot. By © 2000 Jane Bonacci, The Heritage Cook. All rights reserved. Unauthorized use and/or duplication of proprietary material without prior approval is prohibited. I can be contacted via email: heritagecook (at) comcast (dot) net. Feel free to quote me, just give credit where credit is due, link to the recipe, and please send people to my website, www.theheritagecook.com. « Thanksgiving Leftovers Recipes: Soups! That green bean casserole is beautiful!! Have a lovely Thanksgiving! There is something about the green bean casserole that just screams Thanksgiving. Have a great one!! !